The American Human Rights Council (AHRC-USA) joins the international community and peace-loving people across the world in observing and recognizing November 29, the International Day of Solidarity with the Palestine People. 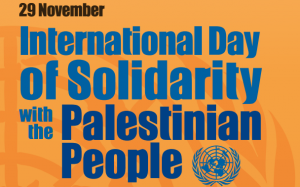 The International Day of Solidarity with the Palestinian People is an observance set by the UN General Assembly resolution number (32/40 B) on 1977 observing November 29 as the International Day of Solidarity with the Palestinian People. Events are held at the United Nations headquarters in New York, as well as at the United Nations offices at Geneva and Vienna. It is generally held on November 29 each year to mark the anniversary of UN Resolution number 181, the resolution on the partition of Palestine that was adopted on November 29, 1947. This year’s occasion comes amidst major challenges that have dimmed the hope for peace and serve as a constant reminder that it is long over-due for the Israeli occupation to end and for Palestinians to be granted their basic human and political rights. Despite the massive military imbalance between Israel and the Palestinians, there is NO military solution to the conflict. The latest Israeli attack on Gaza is just one example that military actions are not the answer. Ending the Israeli occupation is the basic step towards ending this unfortunate conflict. Peace requires the effective , fair and just engagement of the international community in the peace process. 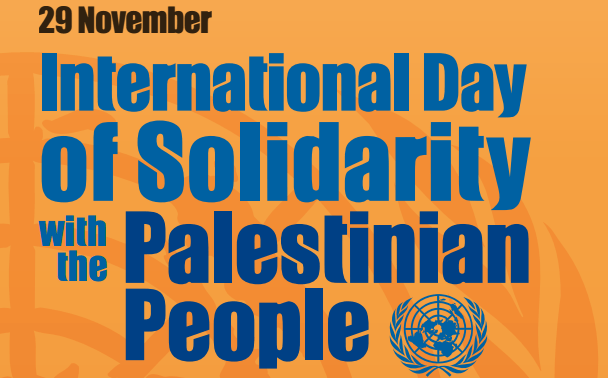 “This year’s International Day of Solidarity with the Palestinian People takes place at a time of turmoil, trouble and torment. The decades-long Palestinian struggle for self-determination, independence and a life of dignity faces numerous obstacles, including continued military occupation of Palestinian territory; ongoing violence and incitement; continued settlement construction and expansion; deep uncertainties about the peace process; and deteriorating humanitarian and economic conditions, particularly in Gaza, ” said U N General Secretary António Guterres. “The Palestinians are equally human to the Israelis and are entitled to political and human rights,” said Imad Hamad, AHRC Executive Director. “Ending the occupation, recognizing the right of return and a viable Palestinian state with its capital in Jerusalem is the only way to end this conflict,” continued Hamad.